This will help reduce disparities and conflicts between the states thus helping in attaining non-linear growth, Kalam said in his address at the Fourth International Conference on Federalism here. "Working together is the need of the hour. The nation can work together on common issues for achieving sustainable growth," the former President said. "India has 28 states which are multi-religions, multi-lingual and multi-cultural...Hence the solution to the problem and development also should be region-based," he said and added region-based growth will give a fillip to growth and provide equal opportunities. 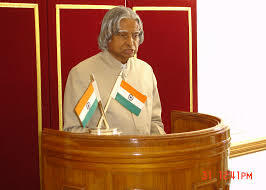 A federal economy should aim at reducing the rural-urban divide while providing a prosperous and healthy future devoid of terrorism and having a sustainable growth, Kalam, who during his tenure as President had been advocating at Providing Urban amnities in Rural Areas (PURA), said. "We are a democratic billion people who need quality leadership," he said adding to succeed leaders require a shared vision for the nation, with an ability to take real time decisions, to travel along an unexplored path and nobility in management. I love my Country and love spreading the good things about my incredible India and the result is this blog before all of you...Enjoy the Incredible India !! Is there a market for new small cars?